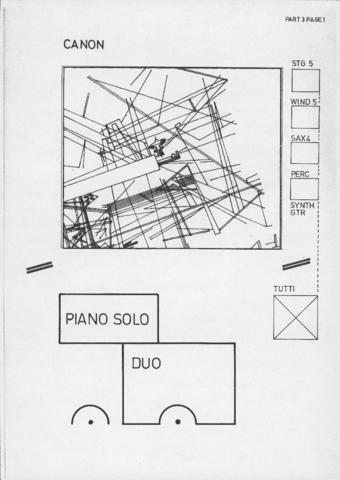 Item is a complete conductor's score for part 3 of Nasca Lines, in graphic notation. The conductor uses the score in conjunction with coloured flashcards associated with each instrument group (string quintet; wind quintet; saxophone quartet; and percussion, synth, and guitar trio). These flashcards are lost and not part of the Music Score Library. The graphic notation is taken from an aerial representation of an area of the Nazca Desert in Peru, featuring the condor geoglyph in the centre. Some of the pages are in colour.